The Annunciation generally includes two figures – Mary and the winged angel, Gabriel. Who is Saint Emidius? you may ask, as I did when saw a third figure of a man in deep discussion with Gabriel. Carlo Crivelli gave a nod to history when he included Saint Emidius, a Christian bishop who lived c. 279 – c. 309 AD, during the time of Diocletian. Legend has it that Saint Emidius exchanged his pagan beliefs for Christianity, left his home of Trier, a city in Germany on the banks of the Moselle, and set off to Rome where he became renowned for his healing abilities. Many believed he was the son of Apollo and transported him, against his will, to the Temple of Aesculapius (Greek hero and god of medicine) on the island in the Tiber. Saint Emidius continued to heal the sick. At the same time, he destroyed pagan alters and converted many to Christianity, which made him extremely unpopular with city officials, a foreshadowing of what was to come. Saint Emidius was made a bishop by Pope Marcellus I, and was sent to Ascoli Piceno, a town and commune located in the Marche region of Italy. Along the journey, there was a fateful meeting with a local governor, Polymius, who made every attempt to persuade Saint Emidius to worship Jupiter and the goddess Angaria, the patroness of Ascoli, including offering his daughter, Polisia, to him in marriage Instead of a wedding ceremony, Polisia was baptized as a Christian, which led to Saint Emidius’s martyrdom. “The Annunciation, with Saint Emidius” was originally created as an altarpiece for Ascoli Piceno’s Church of SS. Annunziata to celebrate the granting of self-government, in the year 1482 to Ascoli Piceno by Pope Sixtus IV. As their patron saint, Saint Emidius, was given a role in the Annunciation. Positioned beside the angel, Gabriel, Saint Emidius holds a model of the town he watches over. There is an earnest reverence in his demeanour. 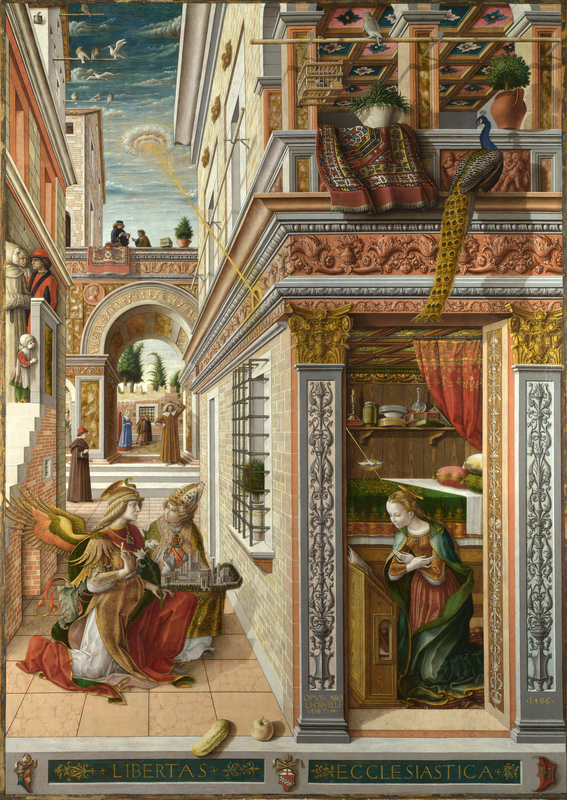 Carlo Crivelli’s Annunciation reminds us that spirituality contains many stories, unique to the experiences of time, location, and social interaction. He is a storyteller who instilled within the colours, figures and symbols, a profound and lasting significance. While we view this painting via the lens of our century, the narrative comes through with a vibrancy that captures our imagination. A city in celebration and transition, an artist who recognized the tradition that came from a historical event, an artwork that reflects the hopes, dreams and beliefs of a people – these are themes that resonate within the larger narrative of humanity. It really is timeless isn’t it! I loved the podcast about the food that was displayed in the painting. The amount of information readily available about paintings is remarkable. I can visit all the art galleries of the world via the internet. Now that is a marvelous Christmas gift that keeps on giving all year around. It’s incredible to have access to such riches from our armchair. Thank you for bringing us this wonderful painting and the fascinating story behind it. The detail in the painting is a delight. I particularly like the little child looking on. How very well said! Merry Christmas! Finally; I was able to view this outstanding painting! Beautiful on all levels–and new thoughts on this marvelous event. Your words and thoughts are so profound and valuable. Love this post so much. Thank you for sharing the painting and your thoughtful words to go with it. I am delighted that you enjoyed this painting. These past weeks have been a wonderful exploration into how artists have interpreted the memorable event. Merry Christmas! Ich mag die Malerei von Crivelli auch sehr, sie passt so wunderbar zur Adventszeit. Herzlichen Dank und Ihnen und ihrer Familie ein frohes Weihnachtsfest. Ich freue mich, dass Sie an meiner Erkundung der Verkündigung teilgenommen haben. Ich habe diese letzte Woche viel gelernt. Kunst ermöglicht es uns, ein tiefes Gespräch zu führen. Alles Gute der Weihnachtszeit an Sie und Ihre wunderbare Familie. I love this Carlo Crivelli painting. Such detail and so much to see. Thank you for this fascinating blog post, Rebecca! Thank you, Elisabeth! I agree – the symbolism, the colours, the figures in the background are the antithesis of Fra Angelico’s tranquil portrayal. Carlo Crivelli places the message transmission in the centre of a busy intersection and with a barrier between Gabriel and Mary, which I found fascinating. With all the activity and the barrier, I wonder how the Gabriel’s message was heard by Mary. I was reading that some think that the beam of light suggests an UFO sighting, which reminds me that there are many interpretations given to art, depending upon our personal preferences. What I enjoyed most about this painting was that it combined three time periods into one. Time was of no consequence. In art, everything is possible. So glad you enjoyed this post!!! So true, in art, everything is possible!!! This is one of those paintings that you can look at for a long time, discovering new details and wandering about their meaning, really fascinating! Thank you for your joyful message! All the ver best of the festive season! Ethereal on so many levels! Merriest Christmas Rebecca to you and your family. Ethereal – that is the perfect word for this painting. So many stories held within this artwork. It was so much fun to learn about Carlo Crivelli’s view of the Annunciation. All the very best of this special Holiday Season to you and yours! A new year of adventure awaits our arrival.